The weather looked perfect for another session with the Tree Swallows on Saturday. Since the main source of food for tree swallows are flies the best time to see and photograph the swallows is with little to no wind. Saturday morning called for sun and 10 km of wind which was perfect so I couldn't resist getting another fill of this beautiful bird. I headed out at 5:30 am to Neville's pond as the sun began to rise but that was short lived. See this time of year here on the island is known for fog and lots of it. Its not uncommon for the weather forecast to say sun and no cloud but when you wake that morning you can't see two feet in front of you because the fog is so thick. Which was the cause this morning as it rolled in.Fingers crossed for a quick moving fog as I setup my tripod and camera. 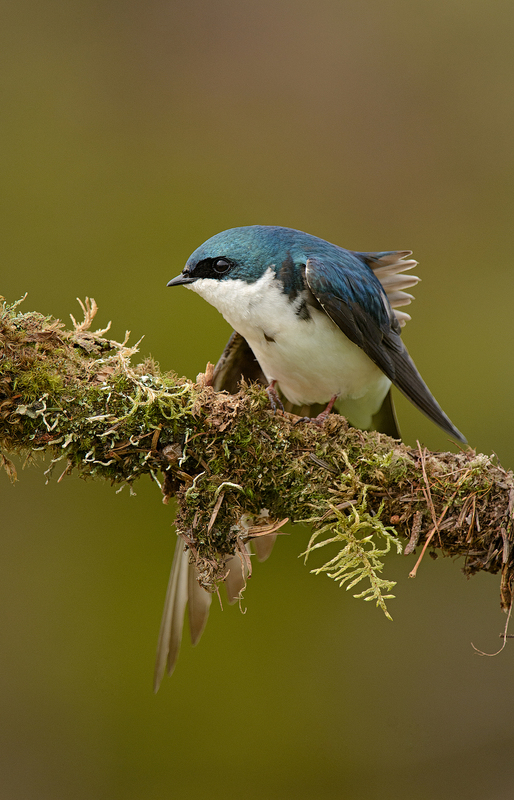 The tree swallows had no plans to let the fog stop their daily activity of nest building and feeding. One pair in particular were continuously gathering nesting material so I spent most of my time focused on them. I tried a few attempts at some interesting in-flight shots with my 70-200mm F2.8. I have to say these guys are not easy to track especially in fog. They rarely stay on one path when flying... constantly banking, turning and diving so tracking them is hard. Here is a shot as one of the swallows was coming in to its favorite spot to gather dried grass. After little success at inflights and the fog looking like it was never going to lift I decided to grab a few shots of the swallows on some perches. The below shot is a fav. from the day and probably my best shot of a swallow to date. Because the fog had muted out the sun it created beautiful diffused lighting allow me to capture the exposure perfectly on this swallow. It was shot at ISO640 (which is the furthest I want to push my D7100) at 1/250s. I wish I owned a full frame camera and a 500MMF4 lens that would give me the needed ISO and image quality to capture more images on cloudy / foggy / rainy / snowy days. Those types of days create the most dramatic images and allow for proper exposure especially with birds that have dark and white feathers. As the morning pressed on the fog finally decided to lift and my focus shift to a lower perch with a more colorful BG. In the fog I would not have been able to get enough speed at ISO640 to capture a decent image in this setting. When capturing birds on a perch I always look for and hope to photography an image with that little extra something. What I mean by that is not just the bird sitting there looking at you but with them doing something....open beak, stretching, calling, or pruning. I was lucky enough to capture a few images that morning. In the image above this swallow had just defended its nest box by grabbing another swallow and dunking it in the water. I honestly didn't think they were going to come out of it alive but they did and lucky for me it came to the perch to clean/dry off. Above it was fanning out its tail feathers. Lastly a long stretch of the wing. I wish he was back on to me when doing this one but we can't have it all right? While photographing the swallows I was continuously hearing the calls of a near by Savanna sparrow. For the most part they are over looked since they are so common but I just had to grab one shot. With my gear packed up, empty Tim's cup in hand and heading back to the CR-V I noticed one of the swallows sitting on a branch in what I hoped would be a nice picture. I slowly laid down my things and crawled over (the branch was about 2 feet off the ground) to grab this final shot as the fog was rolling back in.